Tubeguns have become increasingly popular with High Power and tactical shooters. With a modern tubegun kit, you can produce a highly accurate rifle using an inexpensive "take-off" Rem 700 action. (Or you can employ one of the many custom Rem 700 clone actions.) For the prone or position shooter, tubeguns offer many advantages -- the rifle stock is very ergonomic and the low-profile site base works equally well with either scope or iron sights. In this article we feature Gary Eliseo's latest tubegun kit, the RT10. Designed around a Remington 700 long action, the RT10 handles long cartridges such as the 300 Win Mag or the classic 30-06. For the RT10, Gary developed a proprietary single-stack magazine that performs superbly in rapid fire. 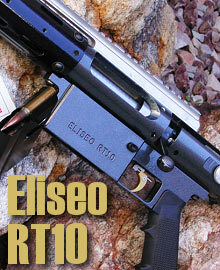 In this article, ace prone shooter German Salazar puts his new RT10 through its paces. 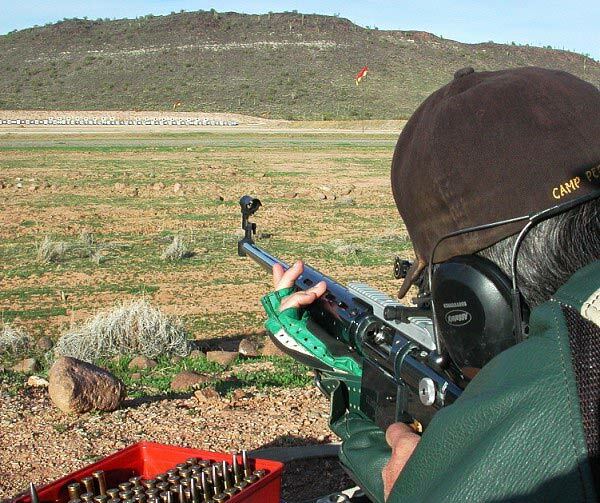 German shares his accuracy secrets in a section on hand-loading for the 30-06. German also provides a step-by-step guide for gluing a Remington action into the RT10. Mention the 30-06 at a High Power match these days and most people will think you're talking about vintage rifles used in the Civilian Marksmanship Program's Springfield and M1 Garand matches. However, those of us who cut our teeth in High Power when the 30 caliber was the only choice and who shot an M1 Garand for our Distinguished badges, know that the old warhorse 30-06 is plenty accurate. 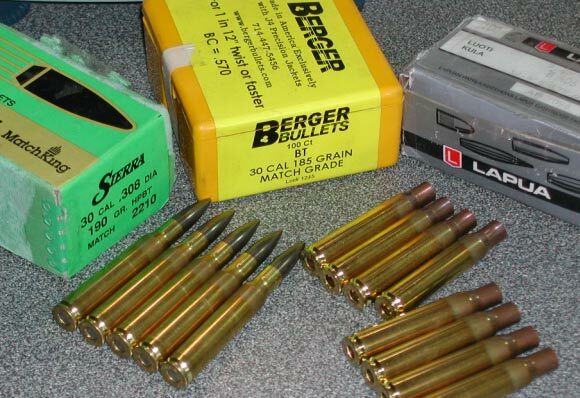 Plus, today's new bullets, such as the Berger 175gr, 185gr and 210gr offerings, bring America's favorite 20th Century cartridge comfortably into the 21st Century. When you put that great old cartridge into a rifle as modern as the new Eliseo RT10 Tubegun, you have a perfect melding of the old and the new -- a rugged, reliable rifle that can withstand extreme temperature changes or rough handling and still produce winning scores. 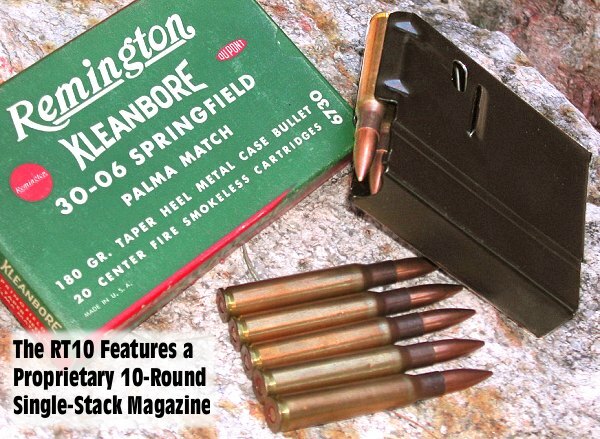 Rock-Solid Detachable Box Magazine -- During practice and load-testing, I ran about 40 rounds through the magazine, it functioned perfectly, never a hitch of any sort. It drops free at the touch of the release button and would be perfect for across the course shooting as well as its intended use in military and law enforcement applications. The Tubegun concept has been around for a number of years now and has proven itself to be a very good alternative to traditional stocking methods. Made from precision-machined aluminum rather than wood or hand laid composites, the Tubegun is typically available from the manufacturer with little delay. A reasonably handy owner can install the action himself, without needing a professional gunsmith to do inletting or bed the barreled action to the stock. I'm especially pleased that Gary made a left-handed version of the RT10 right from the start, not everyone remembers lefties! The Eliseo Tubegun line, which includes models for long and short action Remington as well as Barnard and Savage actions, are particularly simple to assemble as they do not require the action to be glued in to the center sleeve. However, for those who don't mind the permanent nature of a glue-in, that can be done in order to gain additional rigidity in the system. Our feature rifle was glued-in; the process is detailed in a sidebar below. While the 30-06 isn't the most popular cartridge in the High Power world these days, I selected it for this rifle because I believe the 30-06 still offers a practical combination of good ballistics with reasonable barrel life for a rifle intended for 600- to 1000-yard prone shooting. Obviously the rifle will recoil more than contemporary cartridges such as the 6XC and 6.5-284, but if the shooter can manage the recoil well, it shouldn't prove to be too much of a disadvantage, and 4000- to 5000-round accurate barrel life is a definite plus. I considered chambering the Tubegun in .308 Norma Magnum (essentially a non-wildcat 30-338) but decided to stick with the 30-06 due to my long experience with it and its superior barrel life. Given that I shoot a fair amount of 30-06 from a conventional match rifle, this would also allow me to assess the RT10 platform without undue influence from the cartridge selection. I began the project with a Remington 700 left-hand long action which came from a .270 sporting rifle bought used. The action was in good condition, about 25 years old and showed no signs of abuse. The barrel is an MTU profile with a 1:11" twist. This contour is not as common as it once was, with the lighter Palma taper having essentially become the standard of the long range shooting community; but the MTU profile really damps the 30-06's recoil with the heavier bullets and I believe that's a worthwhile reason to put up with the extra weight. The Bartlein Barrels website shows the MTU profile at 7 lb. compared to 5.5 lb. for the medium Palma and 6.5 lb. for the heavy Palma. I have the heavy Palma on my other 30-06 and there is definitely a difference even with just that half pound out there. 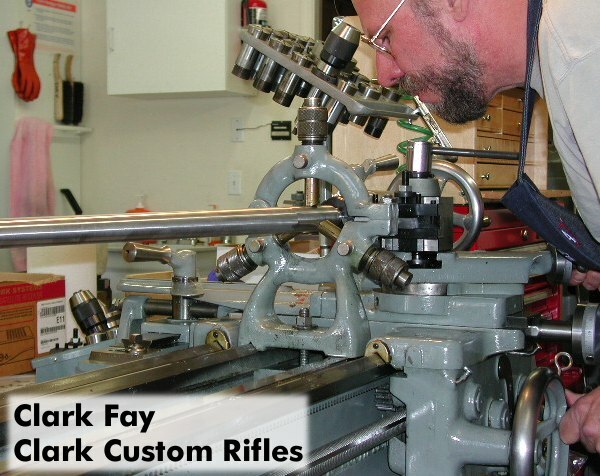 Clark Fay (Clarks Rifles) of Raton, New Mexico has been doing gunsmithing for me for a number of years now, beginning when he was in Phoenix and now in his new shop in Raton (which is as well-equipped and organized as any I've seen). Clark and his wife Trudie are well known among long range shooters; Trudie is a top level Palma shooter and Clark isn't too far behind. Clark, however, is mostly known for his meticulous attention to detail in his gunsmithing and his rifles are a common sight in the hands of top Western long-range shooters. Clark performed the usual accuracy work on the action, including truing the face of the receiver and the bolt face to the centerline of the action, recutting the barrel threads true to the centerline, and machining the locking lugs and abutment square to each other and to the centerline. In addition, I asked Clark to true the outside of the action to the centerline, mostly to create a bit of additional clearance in the sleeve not only because we planned to glue the action in, but also because I noticed in the initial trial assembly with the bare action that it was far from true, showing high and low spots and not bearing evenly. You wouldn't need to do that with a custom action of course, but this project was intended to be done with a Remington, so we did what had to be done and Clark did it masterfully. Clark chambered the barrel blank with the Serengeti 30-06 reamer, print no. 9685, from Pacific Tool & Gauge. This reamer was used to cut my other current 30-06 chamber and it produces great accuracy. The Serengeti has a 1.5 degree leade angle like a .308 as opposed to the 30-06's traditional 3 degree leade; I believe this change is an important factor in getting the best accuracy from a 30-06. The body dimensions are well matched to Redding dies, so the brass is not overworked and lasts for many firings. The freebore on the Serengeti is just right for the 190 grain range of bullets, but if heavier bullets such as 210s are going to be a rifle's main diet, then a slightly longer freebore, perhaps 0.070" longer, should be specified. This reamer's neck diameter is 0.340" which is the SAAMI standard for 30-06 and works well with modern brass. Clark cut the barrel to 28" overall for good balance. With the barreled action complete, my attention turned to the trigger mechanism. 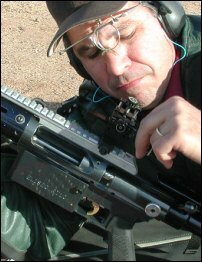 The trigger is the shooter's most direct, most tactile connection to the rifle and as such, I place a very high value on a trigger that gives me the ability to tune it exactly to my preferences and which will then hold those settings flawlessly. For a prone rifle I don't mind a single-stage trigger, though I prefer the additional control you get with a good two-stage trigger. 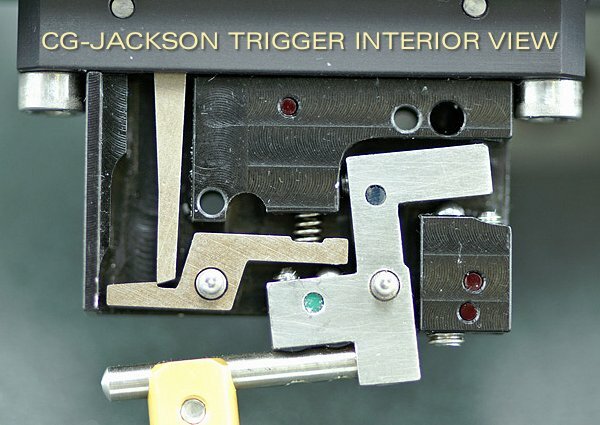 I have worked with many good match triggers over the years – as well as a few atrocious ones – but the CG-Jackson trigger from Tom Myers' X-Treme Shooting Products really stands out as a winner. The CG, which is manufactured in the United States, is a very high quality unit that allows adjustment over a broad weight range and is made for a number of popular actions. As the CG costs less than an Anschütz conversion trigger and is more robust, the trigger decision was perhaps the simplest in this project. For more on the CG trigger, see my CG Trigger Review on this website. Assembly went quickly and smoothly. Jim Cobb, a fellow member of the Desert Sharpshooters Rifle Club, and our expert on Tubegun glue-ins, handled the Epoxy work. (See Glue-in 'How-To' section below). Once the glue-in was complete, I mounted and tuned the trigger to my liking and then added few other parts, such as the Anschütz handstop (for which Gary specially machined the front tube), the Lipski sight base and Warner sight, and the Eliseo front sight base holding an RPA 22 mm front sight. I spent some time adjusting the buttstock to fit me, a process made easier by the broad range of adjustments provided. Now all that was needed was some quality match ammo. Unlike the .308 Winchester, with the 30-06 we're never really fighting for that last little bit of case capacity. That lets us choose brass based on factors other than capacity or weight. I put a fair amount of effort into my brass and want it to last, so durability is a prime concern, along with uniformity. Because my 30-06 loads for 600 to 1000-yard shooting are near the upper end of the allowable pressure range, a durable primer pocket is also a consideration. 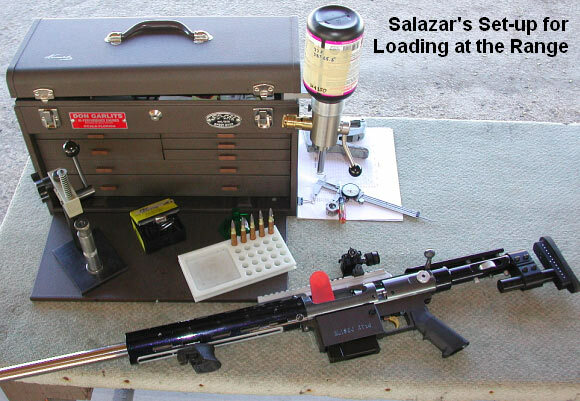 I do most of my load testing with a 30-06 instrumented with a strain gauge and connected to the Oehler 43 Personal Ballistics Laboratory. The Oehler 43 System allows me to keep a close watch on pressure as well as muzzle velocity and gives very useful data such as pressure rise time and total energy. This permits analysis of even small component changes such as different lots of primers along with the more obvious changes such as different powders or bullet types. Bob Jensen, with 50+ years of reloading experience, assists me, running the controls of the 43 system. My basic 600-yard load for the 30-06 is Lapua or Lake City Match brass, Russian (Wolf) primers, Hodgdon's H4350 Extreme powder and moly-coated 175, 185 or 190 grain bullets from Berger, Lapua and Sierra. For 1000-yard shooting I turn to the new Berger 210, also with H4350. I turn the necks on all brass with a K&M tool to ensure uniformity as I have found that the more uniform I can make the necks and thus the neck tension, the smaller the resulting elevation spread at the target. For this same reason, all bullets are pointed using the Whidden pointing die. With bullets in the 185 to 190-grain weight range and 28" to 30" barrels, I have found that accuracy is very good with muzzle velocity between 2750 fps and 2800 fps. Fine-tuning seating depth and neck tension are the final steps in getting to a load that will consistently and reliably produce winning prone scores. Each barrel will react a bit differently to these factors, so your own experimentation is essential. I use a Redding body die to size the case, followed by a Redding bushing type neck die. I bring the neck to its final size in two steps, first with a bushing halfway between the neck's fired diameter and my desired final diameter and then a second pass with the final-size bushing. I have found that this process gives better neck-to-body concentricity if the fired dimension is more than 0.004" greater than the desired, final-sized dimension. While the rifle has only been together for a short time, I've been able to shoot it in a few matches at 500 and 600 yards. 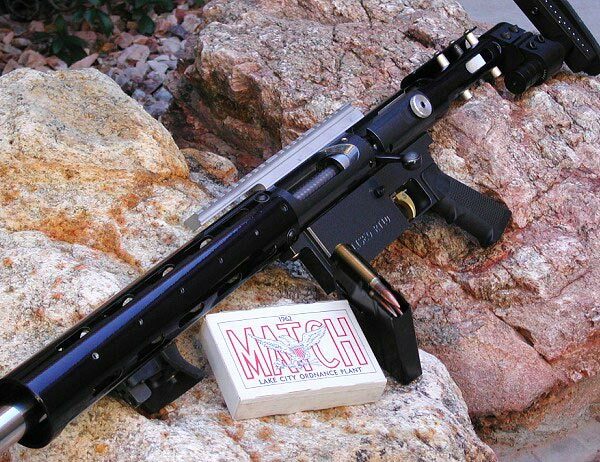 The first match was a 600-yard prone match. This went well, but not as well as I'd hoped. The load that shoots very well in my other 30-06 and which chron'd well in this one, just didn't hold great elevation. As usual for Phoenix, it was windy and I shot a 197-5X, 200-8X and 194-4X that first day. The load, 53.5 H4350 with moly-coated 190gr SMKs in Lake City match brass, just didn't "want to shoot". Additionally, I was still making adjustments to the stock and the last string especially reflected not getting it quite right. I went back the next day with the adjustments more sorted out. My load was the 175gr Berger and 55.0 grains of H4350. Though it was still windy, this time I shot a 198-11x, which was the top score fired among 72 shooters on the line. (This was the 600-yard stage of a cross-the-course match). The following week we had a 500-yard prone match and I decided to shoot three different loads. The first was the 175gr Berger with 55.0 grains of H4350, the second was the 190gr Sierra with 53.5 H4350, and the third was the Lapua 185gr D46 FMJ match bullet with 54.0 grains of H4350, all in Lake City match brass with Russian primers. Results followed the previous week well with a 198-15X for the Bergers, a 198-5X for the Sierras and a 200-12X for the Lapuas. This time, conditions were milder and I saw a few execution errors that cost me the lost points. The X count on each was a better indicator of each load's potential. I'll keep working with the various loads, but with the Berger and Lapua bullets shooting as well as they are, I'll focus on them for this barrel. Overall I've been extremely pleased with this rifle as a system and with the RT10 stock in particular. I've used conventionally-stocked rifles in prone competition since 1971. This stock is a radical departure from what I've always used and I was somewhat apprehensive about it. However, once I got the adjustments sorted out, it has turned out to be as comfortable as any other stock I have. The buttstock was easy to adjust; the cheekpiece and fore-end are comfortably shaped--Gary has a real winner in this design. The only item that I'd like to change is the plastic AR15 pistol grip. That will soon be replaced with of one of Doan Trevor's wood grips which are more vertical, and a lot more hand-filling. This rifle is a 30-06 because that's my pet cartridge; no matter what else I shoot, the '06 is the one that really makes me smile. The RT10 design and the magazine, however, will function with any cartridge up to 3.33" in length, from a 6XC or .308 up to a .300 Winchester Magnum so don't feel constrained in cartridge selection. Combine that cartridge flexibility with a few barrels (that can be easily changed), and you have a very flexible system for long-range, across the course, or tactical applications. Tough as the Arizona desert, with a little California flash... not bad, not bad at all. With the 30-06, it is not difficult to develop good loads for 600- to 1000-yard shooting. The 30-06 reloader can choose among a huge variety of suitable components for this classic cartridge. For long-range shooting, the 30-06 is at its best with medium- to slow-burning powders and mid-weight bullets: those in the 175 to 210-grain range. While bullets outside of that range can be used, lighter ones will always be at a ballistic disadvantage and require faster powders which don't make full use of the 30-06's case capacity, whereas heavier bullets such as the 220gr and 240gr Sierras may not stabilize in the standard 1:10" twist, so a 1:9" twist may be required for those. As a cautionary note, the loads discussed herein are intended for modern bolt action rifles. M1 Garands, with their somewhat delicate operating rods, should be limited to bullets no heavier than 180 grains and powders not slower than IMR 4064. 1903 Springfields should be likewise limited in deference to their century-old metallurgy. Beginning with brass, Lake City Match, the old standby, is not as available as in years past, but Lapua brass weighs about the same, is just as durable and is perhaps even a bit more uniform. So Lapua brass is a good choice. Winchester, Remington and Federal make good, usable 30-06 brass (as does almost every manufacturer) but with their emphasis on hunting ammunition, uniformity is not always what a match shooter might prefer. The SAAMI standard for chamber necks in 30-06 is 0.340" and some brass/bullet combinations, such as Lapua brass with the Lapua 185 gr. D46 bullet (0.309" diameter) come very close to the chamber neck dimension. In those cases, neck turning may be needed to maintain safe clearance. Unlike smaller calibers, the 30-06 should have a minimum of 0.004" total neck clearance for safety. The traditional powder choices for long range loads with the 30-06 are IMR 4350 or H4350. Despite the avalanche of new powders that have come on to the market in the past decade or so, IMR 4350 and H4350 remain at the top of the list for this application as they combine the right burn rate with density that just about fills the case. Hodgdon's H4831sc can be useful with the lighter brands of brass and heavier bullets, but with Lapua or Lake City brass it is nearly impossible to get enough 4831 into the case to develop SAAMI maximum allowable pressure -- H4831 is just too bulky. Other new powders such as Vihtavuori N150, N550, and Alliant Reloder 17 may be worth pursuing, but I've been satisfied with H4350's performance and have thus limited my experimentation with powders. Despite its relatively large case capacity, the 30-06 works best with the same mild primers that work well in the .308-size cartridges when using conventional extruded powders such as H4350. While I use and prefer the Russian primers, other types, such as CCI BR2 and Federal 210M, are also good choices. Winchester primers are acceptable if the others aren't available, but I avoid the Remington primers as they generate a much larger flash and more pressure than the others and this is detrimental to accuracy. If you have time to test primers and have access to a standard chronograph, I suggest that you look for the primers which produce the lowest velocity and the lowest standard deviation. That is the combination that usually yields the best accuracy. Once you identify that primer, work with the powder charge to maximize accuracy. For more information on primers in the 30-06, see my article in the September 2008 issue of Precision Shooting Magazine and my article on small primers in the June 2008 issue may also be useful. It has often been said that the bullet is the single most important factor in a given cartridge or load's accuracy. I agree. My course of action in load development for the 30-06 has changed little over the years, mostly focusing on finding the most accurate bullet in a given barrel, then determining the best neck tension and seating depth for that bullet. One new procedure I have adopted is pointing match bullets with the Whidden Bullet-Pointing Die. Bullet-pointing is now standard procedure in all my reloading as my testing has shown an increase in score with it in every application tested. There are more choices available in 30 caliber bullets than in any other, so the experimenter must either set arbitrary boundaries to limit his choices or have a ton of time, money and energy to test them all! Not too surprisingly, I've chosen to set some boundaries -- I limited my experimentation to bullets in the 175 to 210-grain range from Berger Bullets, Lapua, and Sierra Bullets. Even with those limits, there are still quite a few useful bullets to test. The four bullets I use most frequently are the 185gr Lapua D46 FMJ, an excellent match bullet which allows great latitude in seating depth, the Sierra 190gr Match-King, the true "standard" for this cartridge, and the new Berger 175gr and 210gr match bullets. I use the 175, 185, and 190 at 500 and 600 yards, and the heavier 210 for 1000 yards. My standard loading procedure for these bullets is to seat them 0.015" off the lands (jumping) and to use 0.002" neck tension. This is with moly-coated bullets; bare bullets may respond to a different setup. I moly-coat all the bullets I shoot in the 30-06 for a simple reason: these bullets are all relatively long for their caliber, have a relatively long bearing surface, and moly-coating helps minimize copper fouling during the 70 or so shots fired in a normal High Power prone match. I don't expect moly-coating to do anything other than to keep the barrel from fouling to a degree that reduces accuracy during those 70 shots. Once the match is over, the barrel is always cleaned before the next use. My final word on loading the 30-06 for long range shooting is simply to be conservative. There is no real ballistic gain in exceeding safe pressures and it is senseless to risk serious injury pursuing a trivial reduction in wind drift. Muzzle velocity is a depreciating asset all the way to the target; a high BC, like diamonds, is forever. Pick an accurate bullet, push it along with a safe and reasonable charge and let the BC work for you. Sierra's manual and many others have charts showing safe maximum charges. Notwithstanding popular belief to the contrary, my pressure testing with the Oehler 43 shows that those charges listed as maximum in the Sierra manual are indeed right at SAAMI maximum allowable pressure and should not be exceeded. The Eliseo Tubegun system does not require that the action be glued into the center sleeve. Normally, the barrel is fitted to the action with a circular recoil lug that seats against the front of the sleeve. The action is then bolted into the sleeve using supplied bolts in the factory action holes. This bolt-in system is perfectly adequate for all purposes and bolt-in Tubeguns from 6BR through .300 Winchester Magnum are in use and providing perfect service to their users. 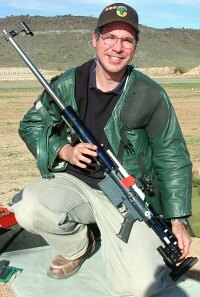 Jerry Tierney, for instance, has won many prone long-range, benchrest long-range and across the course High Power matches with his bolt-in Tubegun. The glue-in or bolt-in decision is roughly the same as the decision to pillar bed or glue-in the action in a conventional stock. Because gluing-in can add rigidity to the system and because I didn't need to remove the action for use in another project, I determined to glue-in the action for my RT10. In preparation for the gluing-in process, the exterior of the action was turned down a few thousandths of an inch. The action-turning was done because this particular action seemed to have quite a few high and low spots resulting from less than perfect polishing at Remington way back when it was made and from the rollmarks which cause some raising of the metal around them. There also appeared to be a bit of warping from the heat treatment process at Remington. These aren't terribly unusual conditions, but truing the action's exterior to a single diameter free of irregularities would provide the epoxy a better, more even surface with which to bond. For this project, I decided to fit the barrel directly to the action with no recoil lug. Eliminating the recoil lug was not an easy decision, but I became concerned that the lug might pull away from the face of the sleeve ever so slightly while the epoxy was drying and the resulting gap, even if just a few thousandths of an inch, would allow the lug to slap the sleeve irregularly as the vibrations of firing went through the barrel. 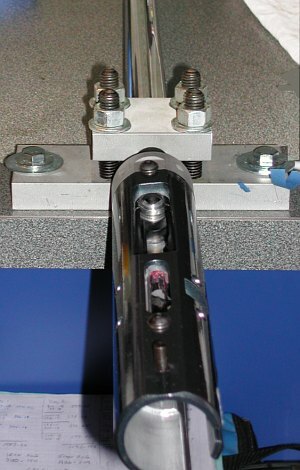 Because the epoxy and the action bolts would do a perfectly adequate job of holding the action in place against the force of firing, the lug was eliminated in the interest of consistent harmonics. An action that is not glued-in would not have this potential harmonic issue because the bolts are tightened while the lug is pressed firmly against the sleeve. Since tightening the bolts can't be done until the epoxy cures on a glue-in, we were faced with a different scenario and eliminating the lug was a practical solution. Just like bedding a conventional stock, surface preparation and effective masking are the keys to an effective glue-in job. All action holes and the trigger slot are filled with wax or clay as appropriate, the receiver's outer surface and the sleeve's inner surface should be roughed up; coarse Scotchbrite will do an effective job. Masking tape should be applied to all interior surfaces that you don't want to be epoxied and to the outer surface of the sleeve to reduce ooze and drip cleanup and a good supply of cotton swabs, alcohol and acetone should be on hand for the cleanup. After degreasing the action and sleeve surfaces, the epoxy is rubbed into them with a wood tongue depressor. This rubbing action eliminates microscopic air bubbles that can reduce the quality of the bond. Both the action and the sleeve must have the epoxy applied to them for this reason. If only one surface is epoxy coated, the quality of the bond will be significantly lower. During the glue-in process we attached the old sporter barrel and the recoil lug to the action. While the lug would not be used in final assembly, it serves as a very useful tool for locating the action fore and aft in the sleeve. As we pressed the action into the sleeve, epoxy oozed from all the expected places and was quickly cleaned up. Special attention was given to the front of the sleeve to avoid having an unwanted bond between the sleeve and the recoil lug; the lug was coated with release agent, but better safe than sorry. Once the action was in place, the action screws were inserted lightly for positioning only, and the cleanup began in earnest. Cleaning up oozing epoxy, removing clay from the trigger slot and trigger pin holes, removing wax from the inside of various action holes and removing the masking tape took the better part of an hour. From start to finish the glue-in took a little over three hours with most of the time spent in parts preparation: cleaning, claying, masking and such tasks. Some 24 hours later, the epoxy was reasonably cured so the sporter barrel and recoil lug were removed and the match barrel installed on the action. Another two days later with the epoxy now truly cured, we fired the first few shots through the rifle. The sight bases had not yet arrived, so that first test firing was with a scope at 800 yards after finishing the first stage of one of our local Palma matches. After a few shots to get on paper, the rifle held the X ring for 5 consecutive shots and we put it away for the day. More shooting would await the arrival of the iron sights and bases. Copyright © 2009 German Salazar and AccurateShooter.com | 6mmBR.com, All Rights Reserved. TOPICS: Gary Eliseo, Eliseo RT10, CompetitionShootingStuff.com, Tactical, Tubegun, Tube Gun, Long Action, Remington 700, Glue-in, Bartlein, Dave Kiff, Pacific Tool & Gauge, Clark Fay, Clark Custom Rifles, 30-06, 3006, 30-Caliber, High Power, NRA Highpower, Palma, MTU, Float Tube, SAAMI, CG-Jackson trigger, X-Treme Shooting Products, Scope Rail, Anschütz, Anschutz Conversion, IMR 4350, H4350, H4831sc reloading, powder, case forming, fire-forming, Berger, VLD, Lapua, Lapua D46, Lake City, Wolf Primers, Winchester, Sierra, Match-King, bullets, moly, John Whidden, Whidden Pointing die.